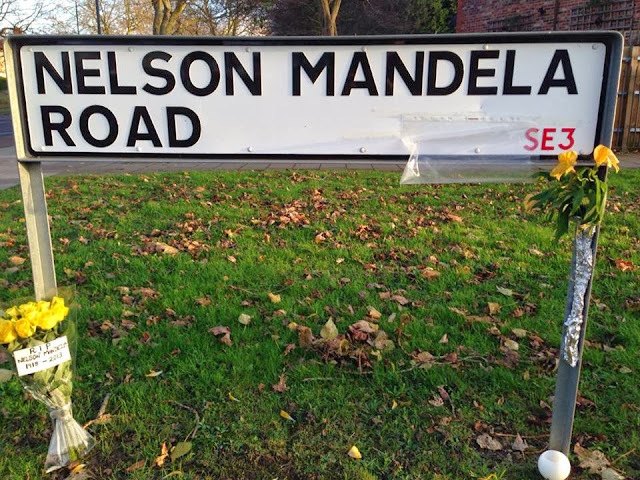 Nelson Mandela Road is one of at least 25 roads in the UK named after the former South African president. "In reality, most addresses with Mandela in the title are on new, showpiece housing developments. This guaranteed that they would meet no resistance from existing tenants, who did not always appreciate having their home address renamed to suit a political agenda." The article details several examples of plans for other roads named after Mandela in the eighties that were fought off by local people. So how do residents of Nelson Mandela Road feel about their street's namesake? I've heard complaints before that the name has held down house prices, compared to houses on neighbouring Hither Farm Road. This seems unlikely to me, but who knows? Perhaps it's the Only Fools and Horses connotation. Or perhaps the name will even have the opposite effect following all the praise Mandela has received since his death. Either way, what better way to show your respect for old Madiba, than to light a candle down on Nelson Mandela Road.